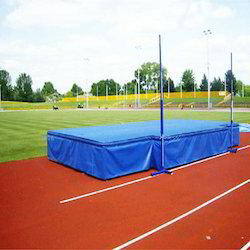 Leading Manufacturer of high jump crash pits from New Delhi. The High Jump Crash Pits offered by us are manufactured using high quality raw material and covered by a very high quality vinyl cover. We provide high density foam and shock absorptions that allows athletes to perform higher jumps. We use premium quality of raw material to manufacture High Jump Crash Pits/Mats. We offer these pits at reasonable price.